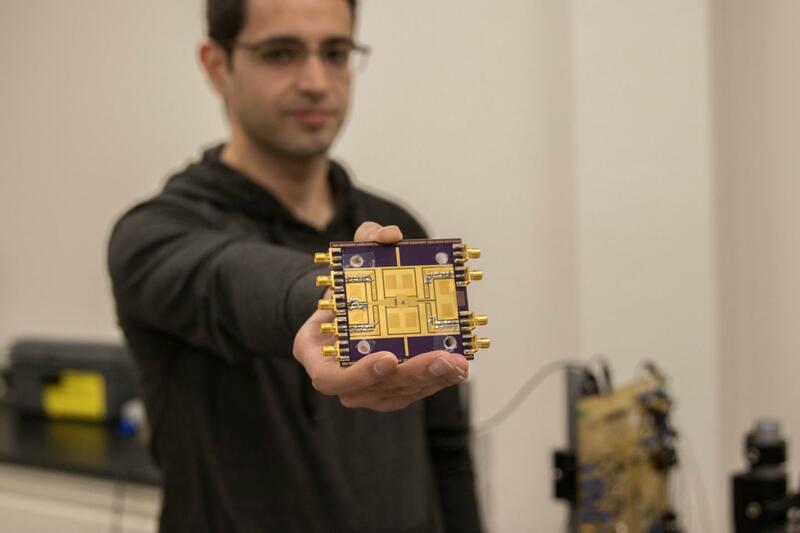 novel, high-frequency electronic chip potentially capable of transmitting tens of gigabits of data per second — a rate that is orders of magnitude above the fastest internet speeds available today — has been developed by engineers at the University of California, Davis. "Phased arrays are pretty difficult to create, especially at higher frequencies," Momeni said. "We are the first to achieve this much bandwidth at this frequency." "Theoretically, 4G cellular networks have reached their data rate limit," Momeni said. "As we continue to migrate to systems like cloud computing and next generation cellular networks, the need for speed is growing. Higher frequencies mean more bandwidth and more bandwidth means higher data rate." The research was supported by a five-year National Science Foundation CAREER grant awarded to Momeni. The ongoing project is titled "Scalable Traveling and Standing Wave Structures for High-Power and High-Efficiency Terahertz and mm-Wave Radiator and Phased Array Systems."